On this past Sunday’s episode of Game Of Thrones—plot details of which will now be discussed—the characters of Oberyn “The Viper” Martell and Gregor “The Mountain” Clegane engaged in combat, a match-up that left one party with a gaping chest wound, and the other lying in a pile of what used to be his own face. 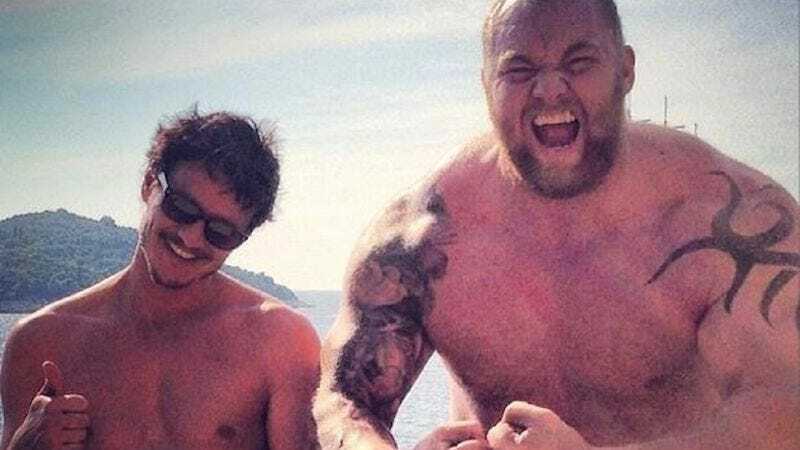 To assure viewers that the horrors they witnessed were fictionalized, Pedro Pascal (who plays Oberyn) posted a picture of himself and Hafpór Júlíus Björnsson (who plays the Mountain) to Instagram. It shows the two actors hanging out in their swim trunks, acting like everything’s fine, and that one didn’t just crack the skull of the other wide open like it was a brittle eggshell. Pascal even gives the photographer a thumbs-up gesture, showing no indication that he wants to slice open his companion’s hamstrings in revenge for the murder of his sister. Björnsson flexes his arms, presumably because it’s a fun photo op, and not because he wishes to convey his ability to crush the puny bodies of those who displease him between his thumb and forefinger. Everything, in short, is fine, and it was all an act, and it will stop showing up in your nightmares eventually. It’s fine.